What is a garden? I took a course on the history of gardening in the Department of Landscape Architecture art the University of Oregon (it began with the Garden of Eden, of course) and learned that any intervention in the outdoor environment can be considered a garden. It needn’t have a lawn or an ordered arrangement of planting, or even plants; think of the stones and raked sand in Japanese temple gardens. These thoughts came back to me last week when I visited the Mattress Factory in Pittsburgh, one of the most interesting art venues I know. The Mattress Factory describes itself as a laboratory for artists and “a museum of contemporary art that presents art you can get into — room_sized environments, created by in-residence artists.” Like Philadelphia’s Fabric Workshop and Museum, staff are there to help visiting artists realize their ideas, with the hope that the opportunity will allow them to explore new directions. I first visited the Mattress Factory in 1987. The Carnegie Museum of Art‘s curator of contemporary art, John Caldwell, told the group of curators who had come from around the country for the International Exhibition that we absolutely had to see the Mattress Factory. So three of us, on our way to the airport, paid a taxi to wait while we had a much-too-hurried visit. Even then there were two permanent installations by James Turrell (now joined by a third), and I doubt we stayed long enough for our eyes to sufficiently light-adjust. I’ve stopped by when in Pittsburgh for subsequent Internationals and seen a seat-of-the-pants operation expand and develop into something very polished. But they’ve maintained their initial vision. Next to the original building (which used to be in a run-down neighborhood, now considerably gentrified) was a vacant lot with the foundations of a bakery that had burnt down. Philadelphia artist, Winnifred Lutz, studied the lot for five years, and in 1993 began to turn it into “Garden,” which I’ve seen evolve since then. “Garden” is one of the most extraordinary gardens I know. Lutz has packed an amazing amount into the three quarters of an acre plot. When I entered this time it reminded me of Roman ruins. In an urban neighborhood in Pittsburgh, you say? Yes. The terrain is rocky and uneven, with weeds (all right, “indigenous wild flowers”) and bits of grass growing here and there and what looks to be the remains of an amphi-theatre in the far corner. Stairs lead down to the basement of a building long gone. And ruined brick and stone walls surround the space on three sides, with openings that give views of spaces beyond. Then you hear the sound of flowing water. 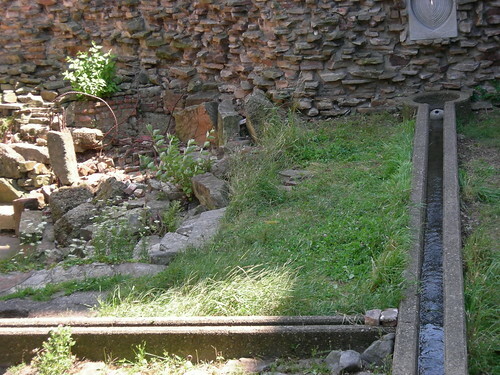 The fountain is the first clear sign of the structure behind this seemingly-abandoned space. It flows from a pipe low on the wall to the left, into a trough slightly below grade (although part of it is entirely exposed, since the ground line is uneven) and bisects the site. It is met by another trough halfway down, at a right angle to the first. Other than the borders of a double row of paving stones along the wall at left, these are the only straight lines to be seen. 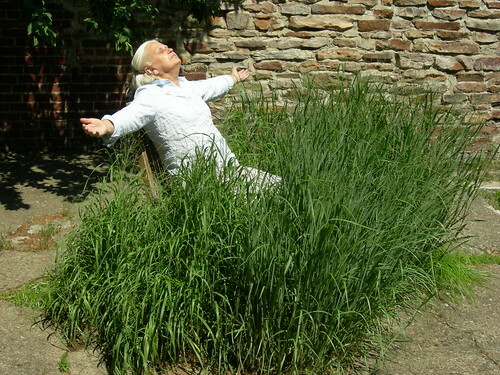 Barbara Neswald in the prairie grass. Further along, sitting at an angle on those paving stones is a stand of tall switchgrass – a miniature prairie. As it sways in the breeze one can just make out a chair sitting amidst the square of grass. And the sound of the moving grass overlays the sound of the fountain’s running water, itself heard over the ambient sounds of the city. These obvious interventions in a seemingly-derelict site cause the visitor to stop and ponder its significance. 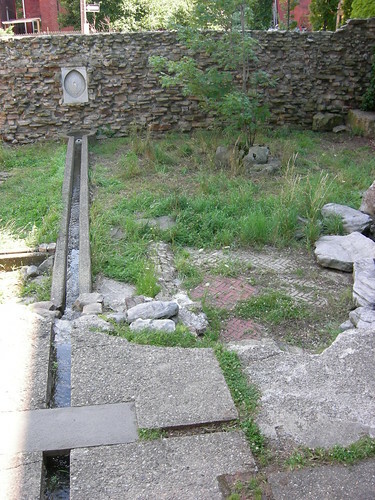 Lutz did extensive research on the history of the site, the neighborhood, the indigenous vegetation and even the local stone; her garden incorporates them all. It reminds us that cities do not eliminate, but build upon and incorporate natural history (much as did Mark Dion’s “Urban Field Station,” commissioned by the American Philosophical Society in 2004). And the modern garden incorporating the ruined building inevitably reminds us of historical time, of death and regeneration. 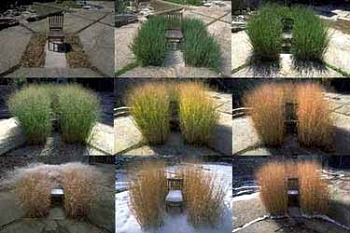 The prairie grasses seen at different times of year. Ruins have long interested artists: Mantegna tethered his St. Sebastan to the ruined column from a Classical building, Fuseli drew an unforgettable “Artist Overwhelmed by the Grandeur of Antique Ruins,” head in his hands as he sits beneath the fragmentary, giant foot from an Ancient Colossus, and Piranesi peopled his prints with exaggeratedly-tiny figures, literally overwhelmed by the ruins of Rome. But in a country whose material culture is rarely more than two hundred years old, and less so in cities like Pittsburgh, Americans haven’t done much with our own ruins (although, courtesy of the web, I found two sites — there are probably others — that specialize in ruins of modern structures: Modern Ruins and Shaun O’Boyle’s website to mention nothing of David Macauley’s wonderful fantasy book, “Motel of the Mysteries”). Ruins (albeit displaced or imaginary ones) were integral to the Romantic garden, and in recent times appear most notably in Ian Hamilton Finlay’s garden, Little Sparta, which is filled with stone fragments on which Roman-style writing is prominent; but I have always thought that Finlay took a lot of credit for the beauty inherent to the Roman majuscule. Lutz has worked with extant ruins and created a garden that looks back without nostalgia, reminding us that the present is about to be the past and we are part of something much larger than ourselves. 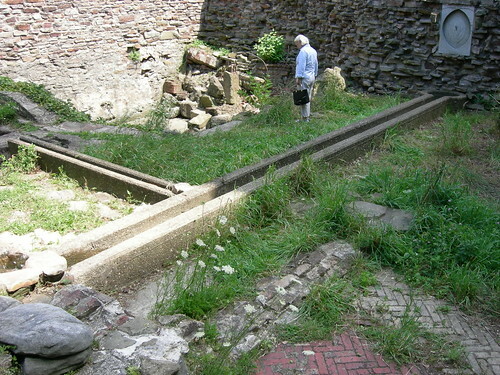 More pictures of Winifred Lutz’s garden at the Mattress Factory website. –Andrea Kirsh is an art historian based in Philadelphia. You can read her recent Philadelphia Introductions articles at inLiquid.